Well, Sunday evening has rolled around yet again in the blink of an eye. The weekends are simply not long enough for me to achieve everything I hope to do. Some weekends are more productive than others and I am pretty happy with what I managed to accomplish. All of the washing and 95% of the ironing are done. Why 95%? The iron decided it was time to die when I only had a few items left. So, one of my jobs for this week will be to buy a new one. I have planned our menu for the week, bought fruit and vegetables, swept and vacuumed the floors as well as doing some painting on the verandah. GMan and I went to the computer shop to buy a new tower for the desktop computer as the other one had been deemed as unrepairable. The new one should be ready next weekend. Apart from sanding and painting GMan managed to do all of the mowing so he has been busy, too. However, the weekend was not all work as we went to the movies in Maleny on Saturday evening to see, ‘Hunt for the Wilderpeople’. It was both funny and sad in places and I really enjoyed it. A couple of weeks ago we suddenly lost power in one section of the house. After a bit of investigation, we discovered that one circuit had been tripped and it did not take long to locate the culprit – the sandwich maker. Each time we plugged it in it tripped the circuit so we decided that after many years of faithful service it needed to go in the bin. When an appliance ceases to work, it is a good time to review whether or not you really need to replace it. Although we eat very little bread we decided that a replacement was necessary as we use this handy little appliance frequently. The thing I cook most on it are these gluten-free buckwheat pancakes. I find they cook much better on this surface than in a frying pan. I also use it for tuna patties, vegie burgers and meat patties. I did my research and decided on another Sunbeam Cafe Grill. I like the floating handle which is hinged in the centre and allows the top to apply even pressure across the whole plate rather than being hinged at the back. The new one is smaller than our previous one but that suits us. I am looking forward to making some pancakes this weekend. No, I am not getting rid of my dishwasher but simply giving it a thorough clean. The dishwasher is a 2 drawer Fisher & Paykel which was installed about 7 years ago when we renovated the kitchen. We regularly wipe over the inside and outside of the machine but had never taken the filter out of the base. Today I removed the racks, spray arm and the filters. I used a damp cloth to wipe off any scum and then dried the inside of the drawer with a dry cloth. I cleaned the filters which had a small amount of scum build-up on the mesh using a kitchen brush and rinsed them in cold water. Here are all of the pieces drying on the bench. It was easy to reassemble the drawer and it is ready to use for another 7 years – or perhaps I will clean it sooner. Whenever you dismantle something for any reason it is important to take careful notice of how it is put together to save any angst when you come to reassemble it. It is interesting to note that despite the extended time of use the machine generally was quite clean. I think this is testament to the Kin Kin Naturals dishwasher powder that we use and that GMan is quite particular rinsing dishes before loading them in the dishwasher. This is a timely reminder to maintain appliances to keep them in good working order. After much debate and research, I finally ordered a high-speed blender on Sunday. 3 days later it is here. Out of the box and set up. Bright, shiny and red………of course. There are instructions to read and recipes to try, but that will have to wait for another day. I am at home on Friday some perhaps I will be able to try it out then and share some more details then. Before you start offering condolences, it is not a person but a couple of my kitchen appliances. In the past week or two both the microwave and breadmaker have ceased to function. GMan and I are planning to go to the appliance store tomorrow to purchase a new microwave. I have previously had a Panasonic and from what I can see from my research we will probably buy another similar one this time. Through the wonders of social media I have discovered that a friend has an unwanted breadmaker languishing in a cupboard which she has kindly offered to me. I am not sure when our paths will cross so in the meantime GMan decided to have a go at mixing the dough using the dough hook on the KitchenAid mixer and baking it in the oven. I think this is what success looks like. 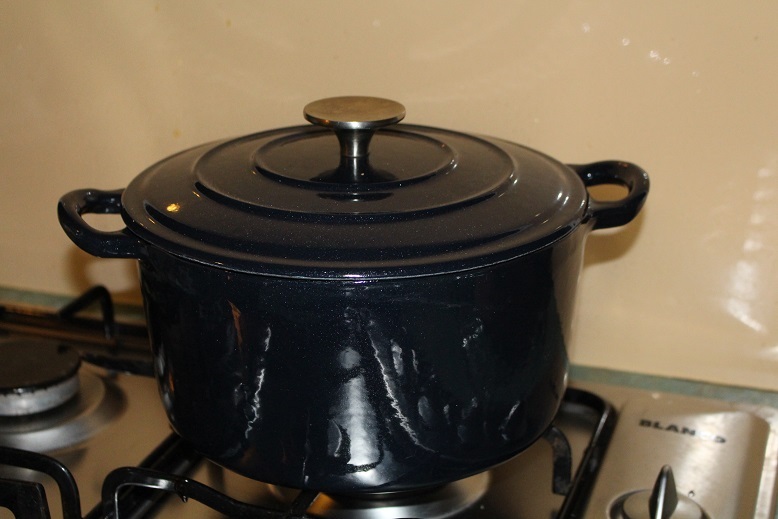 He baked it in this cast iron Dutch oven. It is a little more time-consuming than the ‘set and forget’ breadmaker but will suffice until we replace the breadmaker. 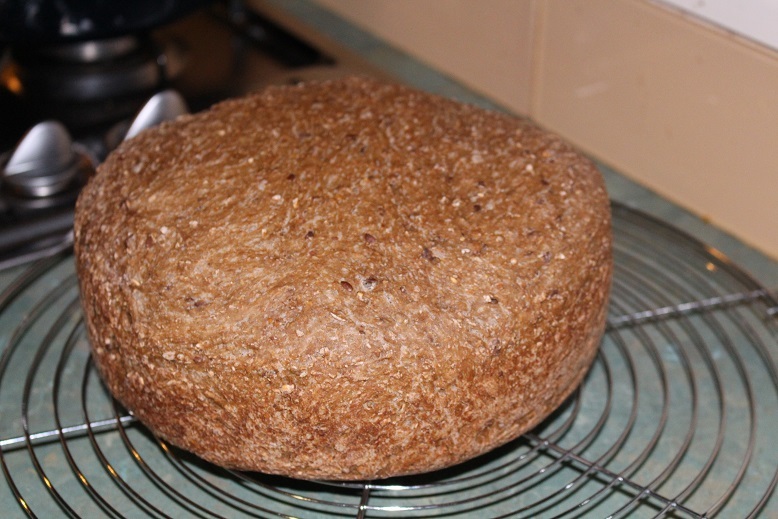 Although we have managed to bake bread and create meals using alternative methods, there is no doubt that both the breadmaker and microwave definitely have a place in my kitchen. 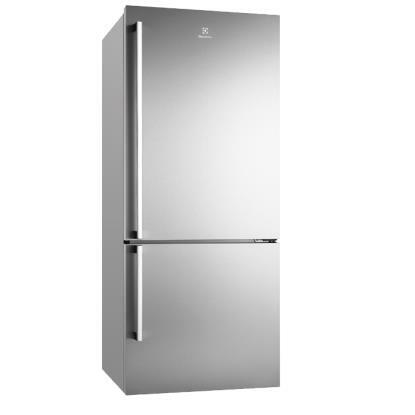 In fact, I would not hesitate to replace most of my appliances as they perform a valuable function. This is a fairly simple strategy – for every item that you welcome into your home another one needs to leave. Whilst this strategy will not turn you into a minimalist overnight, it will certainly maintain the status quo. One of the most popular applications of the ‘one in, one out’ rule is clothes. Buy a new shirt and then choose one that you can move on. If you are having trouble letting one go, perhaps it is time to ask yourself why you bought the new shirt in the first place. Did you really need it? The last time I looked, we can only wear one shirt at a time so why do we need a wardrobe bulging with clothes? Appliances are another area where we can tend to buy a new version yet retain the old one. It is usually consigned to the back of the cupboard or the garage ‘just in case’. Just in case the bright new shiny one breaks down? Do we really buy things expecting them to fail? If the previous one needed replacing it is time for it to go. 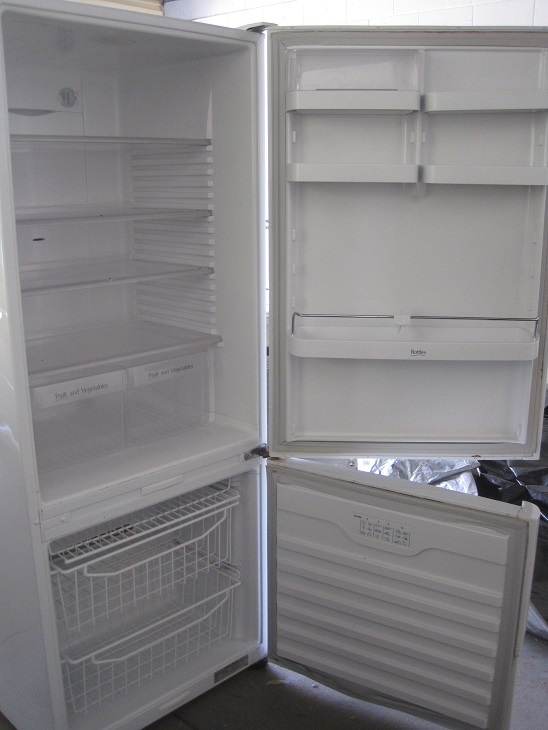 We recently purchased a new refrigerator. After a considerable time spent looking and debating the various options available this is the one we bought. Of course, there was the question of what to do with the old one. The Duke briefly canvassed the option of keeping it downstairs as a ‘beer fridge’ but we realised that it was completely unnecessary and would use up space and electricity. I advertised it on Freecycle and am pleased to say that it has gone to a young couple who were trying to set up a home with very little in the way of resources. Most of us live in relative affluence and virtually everything we buy is an upgrade/replacement/newer version of something we already own. Therefore, there will be something to move out of your home. If the previous item was broken it should be consigned to the rubbish/recycling. If it is still functional someone else may benefit from having it. No-one benefits from it being stashed away to deteriorate in your garage or basement. As an aside, I find this principle of ‘one in, one out’ a fantastic disincentive to shop. “Why spend my hard-earned cash on something when I have a perfectly good one at home?” is the question I often ask myself. How effective are you at ‘one in, one out’?